Want to skip to the results? View the 1530 Hawthorne website HERE. 1530 Hawthorne is our second website focused in North Carolina real estate. With twelve beautiful condos to be rented, we were happy to tackle the task. When speaking with the team at 1530, we were informed about their existing website. It was build with the standard GoDaddy website builder and had been for a while. There was plenty of room for improvement upon first glance, and even more when we dug into the existing site, as well as the client requirements. When redesigning a website, we always make sure to find out the reasons why a client wants a new site. This often drives our thoughts around design and functionality straight to where the client is hoping for. The 1530 site had to effortlessly present their business as professional and experienced whilst being modern and showing off their properties. A major difference to this site versus our previous real estate focused website is the users being targeted. 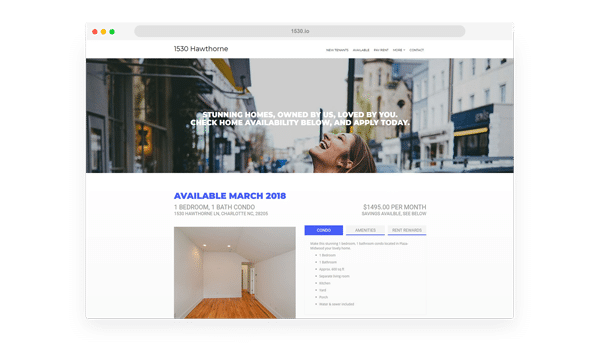 Not only was 1530 looking to attract new renters to their site, they were also looking to use it as a source of information for their existing tenants. It was important that existing tenants could have one source of information to refer to, which would not only save them time, but also answer any questions they had before reaching out to support staff. The result of this project was a clean, well presented website with extended functionality. Not only did the website clearly provide all information users would want up-front, but it also provided them ways to contact the team. 1530’s previous website build was missing mobile responsiveness, meaning users on mobile would have gotten a terrible user experience. As with all Affios websites, we made sure that our client’s new website works beautifully across all device types. To view the 1530 Hawthorne website, just click HERE.